Kim is the Co-Founder and CEO of Rumi Spice, a for-profit social enterprise importing saffron from Afghan farmers. By giving farmers access to markets and an alternative to growing opium, Rumi Spice hopes to lay a long-term foundation for peace in Afghanistan. Before co-founding Rumi, Kim served as a U.S. Army Engineer Officer stationed in Schweinfurt, Germany. In 2010 she deployed with her platoon of soldiers to clear roads of IEDs and ambushes in eastern Afghanistan. 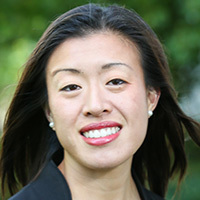 Kim is a graduate of West Point, Class of 2008, as a distinguished honor graduate. In 2015, she earned her MBA from Harvard Business School. Kim is a Tillman Scholar, HBS Social Enterprise Fellow, ultra-marathoner, former Girl Scout troop leader, and volleyball player and coach.